The Slam Dunk Contest is always the most anticipated event of the All-Star weekend. Everyone looks forward to the spectacular. Jordan, Carter, Dwight Howard, Clyde Drexler, Dominique… the names go on regarding those who have participated. Numerous phenoms have dazzled the crowds at the All-Star weekend’s main event. The question is… How many of those athletic phenoms were Jazzmen? How many Jazz players have participated in the dunk contest? Darrell Griffith: Perhaps the most amazing bogo-stick jumper this side of Spud Webb. 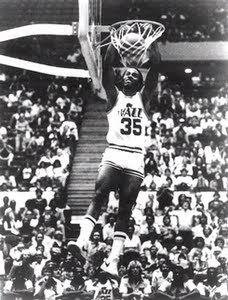 Griffith participated in the very first slam dunk contest in 1984. He placed 4th and then 6th in 1985, dunking against some of the game’s best dunkers… Jordan & Nique. To his credit, and for being relatively short (maybe 6-foot), Griffith could really spring out of the gym. 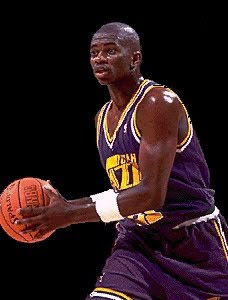 Blue Edwards: Theodore “Blue” Edwards was a unique Jazz player during the Stockton & Malone era. He couldn’t shoot or dribble very well, yet when he made an athletic play, everybody noticed. He inherited the nickname Sky Blue… visualizing his ability to touch those heavenly clouds above the Utah sky-line. Blue took 6th place in the 1991 dunk contest. David Benoit: Benoit was tall, lanky, and athletic. He had great hops! Benoit could arguably be the most athletic player to ever play for the Jazz. Unfortunately, he’s better known to us fans as the one who couldn’t hit a three-point (to save his life!) against Houston in the 1995 first round playoff loss (that was OUR year, not ‘97/98). Benoit placed 4th in the 1993 dunk contest. Jamie Watson: Watson was our 2nd Round pick in 1995. 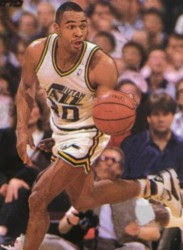 He was a smooth 6-7 wing player who overachieved while playing for the Jazz (like so many 2nd-rounders do). Who knew he even participated in a dunk contest? Well… he did! Watson finished 3rd in 1994. DeShawn Stevenson: Our high school selection who didn’t like Coach Sloan and never fit into our system dunked in the 2001 contest. Stevenson was an athlete, more so than a skilled basketball player. However, he did well in the contest, placing 2nd. Ronnie Price!... Give it a shot. Thanks, Guru. I had no idea that Jamie Watson participated in All-Star weekend.